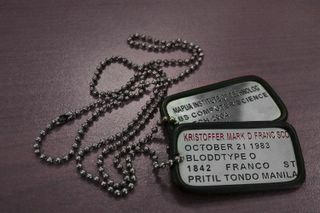 a really late but not forgetten thank you (arigaotou gozaimaste ^__^) to my bestfriend, Fred Ramos, for giving me this really really cool dog tag. Fred is a PMAer (Military student dude) who will be graduating I think next year to be a full pledged soldier. Anyways kudos to Fred in advance for giving honor to our very chaotic but still beloved country. nice tag...ei ask ur friend if he knows someone named rod vincent babera or rodiard babera..rod vincent is a batch mate of mine in HS..c rodiard utol ni rod vincent..haha..wag k n magtaka sa names..rudy kasi name ng tatay..gus2 lahat ng anak may "ROD"